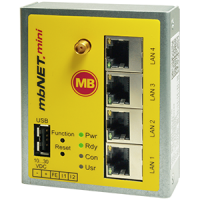 The mbNET.mini is a very compact industrial router for DIN-rail mounting. 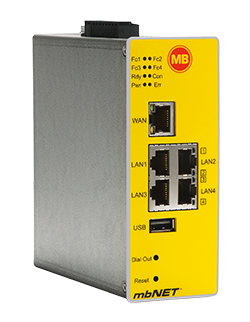 It offers secure IP-based access to Ethernet devices and networks through the remote service platform mbCONNECT24. Therefore, it is not only suitable for remote maintenance applications but also for tasks such as data collection, visualization, alerts and M2M communication. 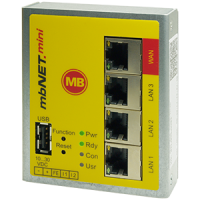 The industrial router mbNET.mini is available in two versions. 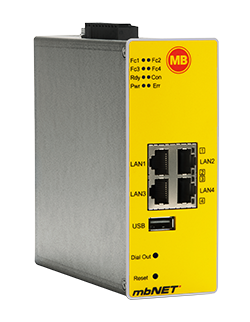 The WAN version uses the existing network or a broadband connection (DSL) to connect to the Internet and offers a 3-port switch. 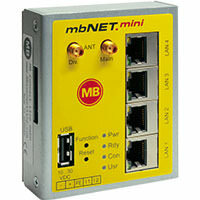 The 3G version allows connection over the mobile communication network and includes a 4-port switch.